As part of a weeklong program to mark the fiftieth anniversary of the death of Judson Dance Theater choreographer Fred Herko, Avant Media presents a concert of music, poetry, dance, and film by Herko’s friends and collaborators at Judson Memorial Church. The concert will feature rarely performed songs by composer Peter Hartman, readings of poems dedicated to Herko by John Giorno, Frank O’Hara, Diane di Prima, LeRoi Jones (later Amiri Baraka), and James Waring, and an interpretation of Jackson Mac Low’s poem First Dance – Making Things New, written for Herko in 1964, choreographed and danced by Gus Solomons Jr. The program is curated by Gerard Forde, who is currently researching a biography of Fred Herko and a history of the New York Poets Theatre. LeRoi Jones, Corregidor (for Fred Herko, the dancer) (1964), read by Gus Solomons Jr.
Jackson Mac Low, First Dance – Making Things New (1964), choreographed and danced by Gus Solomons Jr.
Fred Herko (1936-1964) was a prominent figure in New York’s downtown avant-garde around 1960. Born in Manhattan, he exhibited a prodigious talent for piano and flute at an early age and trained to be a concert pianist. He was accepted at the Juilliard School of Music in 1955, but abandoned his music studies the following year in favor of dance. In 1956, aged twenty, he received a four-year scholarship to study classical ballet at American Ballet Theatre School and within a few years was dancing with established choreographers including John Butler, Katherine Litz, Buzz Miller and Glen Tetley. He danced in James Waring’s company from 1957 to 1964, and in 1961, together with Waring, Diane di Prima, LeRoi Jones, and Alan Marlowe, he co-founded the New York Poets Theatre, which provided a podium for happenings by Ray Johnson, Allan Kaprow and Robert Whitman, dances by Yvonne Rainer and Trisha Brown, music by La Monte Young and Philip Corner, and films by Stan VanDerBeek and Andy Warhol. Herko starred in seven of Andy Warhol’s earliest cinematic experiments, including Jill and Freddy Dancing, Rollerskate / Dance Movie, Haircut #1, and Salome and Delilah. Herko had a close association with Judson Memorial Church. He was a founder member of Judson Dance Theater, presenting six of his own dances in the group’s concerts between 1962 and 1964 and performing in pieces by Al Hansen, Deborah Hay, Arlene Rothlein, and Elaine Summers. In 1963 he performed in Judson Poets’ Theater’s production of Diane di Prima’s musical play Poet’s Vaudeville, directed by James Waring, and in March 1964 he played the role of transvestite Peter Peterouter in Judson Poets’ Theater’s production of Rosalyn Drexler’s comedy Home Movies, with music by Judson’s minister, Al Carmines. In May 1964, Herko staged his evening-length ballet The Palace of the Dragon Prince at Judson. His memorial service was held at the church in November 1964 with poetry readings by Frank O’Hara, Diane di Prima, LeRoi Jones and Jackson Mac Low, and a presentation of his unfinished dance Eine Kleine Nachtmusik, completed by Deborah Lee (now Lawlor). Peter Hartman (1940-1988) studied with Igor Stravinsky, Henry Cowell and John Cage. In 1959 he had a short-lived romance with Fred Herko, who introduced him to Diane di Prima, to whom he was briefly engaged to be married in 1961. He composed the music for the Living Theatre’s productions of Frank O’Hara’s Awake in Spain, directed by James Waring in 1960, Bertolt Brecht’s In the Jungle of Cities in 1961, and Frankenstein, presented at the Venice Biennale in 1964. In that same year he was the youngest composer presented at the Berlin Festival in a concert of his music given by the distinguished pianist Klaus Billing. In 1964 he worked as an assistant to Hans Werner Henze, who conducted Hartman’s Adagio for Orchestra in Munich in December of that year. After living in Rome (1965-69), Wales (1970-1976) and Kathmandu (1976), he returned to his native Los Angeles and then settled in San Francisco where, from 1981 to 1983, he ran 544 Natoma, an interdisciplinary center for visual art, theater, music, cabaret and film. 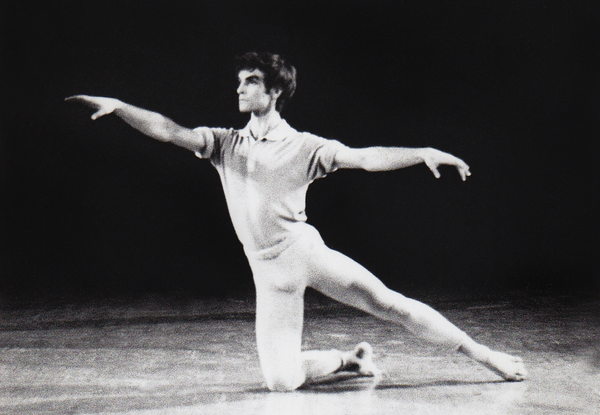 He composed the music for Fred Herko’s Edge – A Work for Dancers and Actors in 1962.